Here's a cover I did for Seattle Weekly for a story by Mike Seely (read here) that argues that Steve Kloves' The Fabulous Baker Boys, starring Jeff Bridges and Michelle Pfeiffer, is the more quintessential Seattle movie than Cameron Crowe's Singles, starring Matt Dillon and Bridget Fonda. 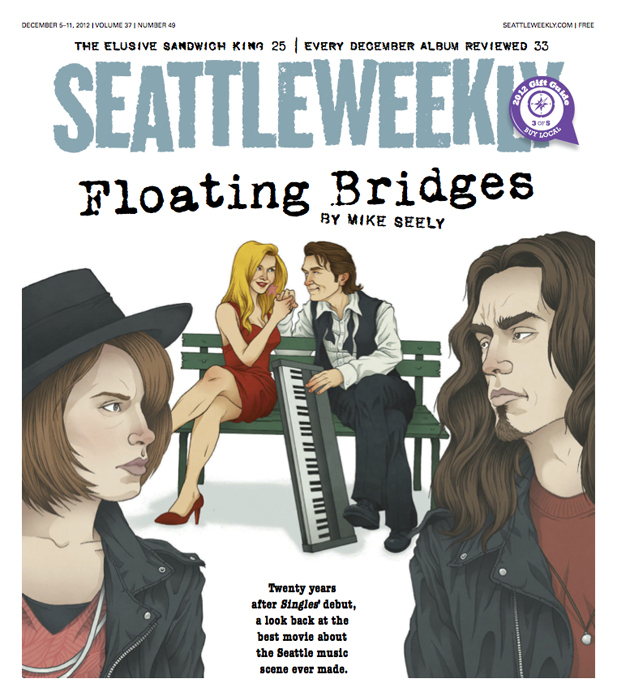 AD Jane Sherman (who is now over at Seattle Met) contacted me with the idea of putting Bridges and Pfeiffer in the iconic pose from the Singles poster, having apparently ousted Dillon and Fonda. I sketched out several variations to find the right combination of the two sets of characters. Thanks again to Jane for such a fun gig!